Well, we did it — we’ve made it through Spring 2014. After an endless winter that left everyone exhausted, another college semester is about to end. Yay! I love this time in the teaching cycle. By now, my students and I know each other very well. The classroom has gotten noisy and cozy; no one is shy anymore. And once in a while, there’s the thrill of knowing that they’re actually learning something. As for what’s next, I’m pretty much taking the summer off to work on my book. While I’ve been chipping away at this project in between grading homework assignments, there’s still tons to do. Clearly, I will be home a lot in the weeks to come. This will be a new experience. I’ve never before given myself this sort of time to write. 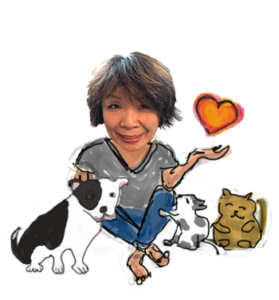 While I’ll miss the busyness of the classroom and all that youthful energy, I’m excited about the writing immersion process. Wednesday, May 7, 2014, 4:51 p.m.: My Spring semester NYU “Food Writing” class ended at 2:40 p.m. today. Keep scrolling…my students have left comments below. Click on the links to each of their names in each of their comments and you’ll find their personal blogs. Most of these websites were launched during the semester. 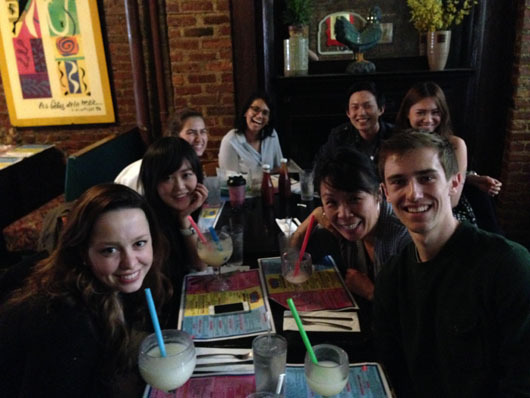 After class, some of us celebrated with a drink in Greenwich Village. Here’s our group shot. Gonna miss these journalism undergrads. We all grew a lot this semester, including me. My students taught me so, so much! Awesome! Yes, this winter as left everyone emotionally and physically drained. I am intrigued by your book, and look forward to learning more!! I already cleaned up outside, got the lawn mower fixed and planted the impatiens. now to clean the cellar! As for writing, I find the best discipline is to do it first thing in the AM, right after coffee. My mind seems to work best then and I am not yet committed to the day’s activities. Regarding re-writing, a well known author (I forget who) once remarked to Truman Capote that he never re-wrote – everything of his went straight from first draft to the printer. Capote replied “that isn’t writing – that’s typing.” There are, of course, those very rare geniuses whose first drafts are always perfect. It does happen. Mozart for example, never revised anything. Never had to. All of his music is just as he first put it on paper. All the rest of we mere mortals however, who have not yet incarnated as world class masters, must face the fact that the topiary creations of our prose always need pruning. I could go on and on – but then I’d have to prune! Sigh. Thanks, Toby. Your comment helps. I think I have to stop setting deadlines. That’s part of letting go. Just let the writing go where it wants to go! Couldn’t agree more – this winter has been brutal (especially for a Californian). I’m excited to learn from you outside the classroom whether it’s from your blog posts or a future hardcover on my nightstand. Thanks for a great semester! Can’t believe the semester is over! I had so much fun with you in class, Betty. I’ll be commuting from Morningside Heights to Greenwich Village and Williamsburg all summer, interning at PUNCH, taking cooking classes and dying from the heatstroke of NYC summer. Let’s grab coffee sometime! Haha, “REWRITE THE WHOLE THING” — sounds like something I’ve experienced in your class! I’m going to miss this semester too. Time to write? You and me both! I’ve finally created a blog and I’m finally ready to sit down and WRITE. Blogging group anyone? Betty I am so jealous that you get to have time off in the summer. I am already dreading three months of summer school. But before I go back to NYU, I’m planning to take trip to Boston or Upstate NY to work on my blog and to explore! We’ve all made it through a tough winter and the rest of a great year is ahead. All of your students are cheering for you this summer, just like you’ve pushed us through the spring! I’m all about the productive procrastinating! Sometimes the cleaning and organizing helps me focus, so when I’m ready to write my mind is clear. Had a wonderful semester with you, Betty! I love this class so much, especially the food HAHA. Oh, aren’t they cute? My students are so adorable. Everyone, the last 10 comments are from my NYU “Food Writing” class. We have 18 minutes left together and here I am, forcing them to comment on my blog!I will miss every single one of them. It’s been a great semester. xoxo. I can honestly say that you’re one of the best professors I’ve ever had. You made class interesting, fun, and I learned so much. I really enjoy your blog posts. It makes me feel a little closer to you as a person. I haven’t experienced that with any other professor. That’s why you’re the best professors ever! Thank you so much for a great semester. I’ll see you on Monday.